One of the tricky parts about being a new parent is that it is all so new and so vitally important. When it comes to your little miracle, you want answers immediately! We all want our babies to be content and when they are not, we can’t help but wonder what is wrong and what we can do about it. Baby teething is a common cause of discomfort in babies. This article will help you identify the symptoms teething babies show and what baby teething remedies to use. This post is sponsored by Wellements, a company focused on safe and transparent baby products. All opinions expressed are my own. 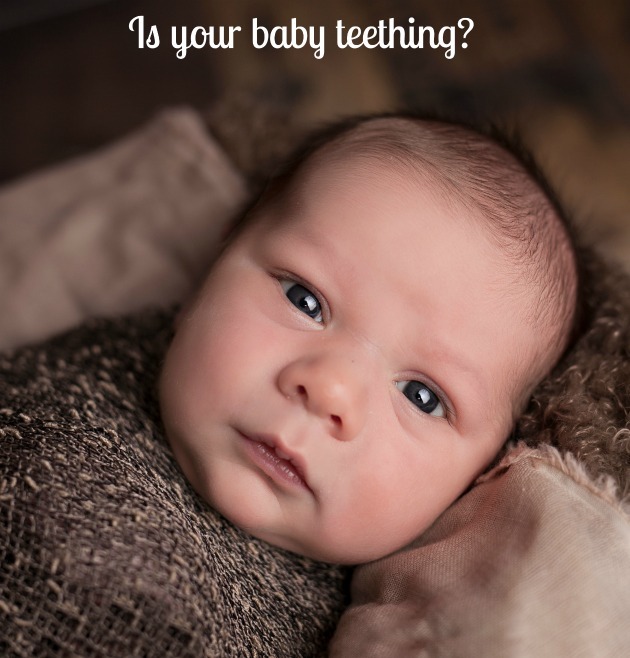 “Teething” is how we refer to the process of baby’s first set of teeth breaking through the gums. I say process because teething usually begins and is worst as they begin to push up through the gums before we even see the teeth actually break through. Well, that is the tricky part. There is no exact age when babies start teething. Each baby is different. So how do you know when your baby is teething? Well, most babies bet their first tooth between 4-7 months (don’t worry if your baby is later, all babies are different). Many babies can begin teething at about 4 months. There is nothing inherently wrong with teething and some babies don’t display any discomfort. Others fuss a ton. Symptoms teething babies may display vary significantly between babies. Between the ages of 1 and 3, your child will grow his full set of 20 teeth so they will be in and out of teething during that time. Dr. John Liu, president of the American Academy of Pediatric Dentistry, says a key indicator is this seeming need to constantly be chewing on something. My daughter found her fist perfect for shoving in her mouth and gnawing her gums against when she was first teething. Drooling is another common sign of teething and usually goes along with the constant chewing. The drooling sometimes results in a rash on the face or neck. Gum rubbing and sucking and two more symptoms teething babies show. Many sources say you may notice irritability or wakefulness or ear rubbing. 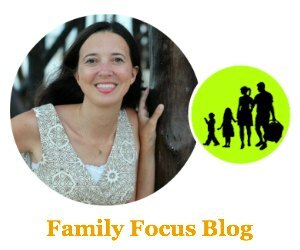 My daughter expressed her irritability most often through crying and it seemed much harder for her than it did for my son who didn’t show many teething signs at all besides drooling. You may also notice decreased appetite and/or a mild temperature as symptoms of teething babies. Mild teething symptoms that get better are usually nothing to worry about but call your doctor if your baby’s symptoms are severe, they don’t get better, or you are at all concerned. Here are three Baby Teething Remedies to help make baby more comfortable when teething. Gently use a clean finger to rub baby’s gums. If they seem to find it soothing keep up the gum rubbing for about 2 minutes at a time. Depending on the age of the baby and if they are old enough to hold themselves upright and hold objects, you may want to provide safe objects for your baby to chew on, such as teething biscuits or teething toys. Make sure you supervise this. 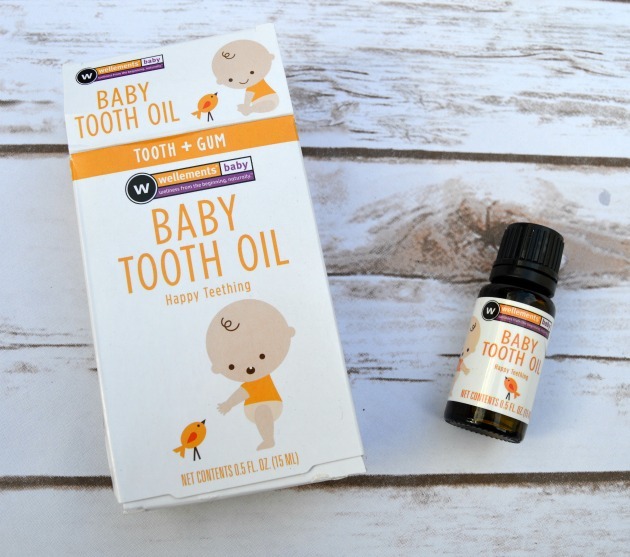 Wellements Baby Tooth Oil is the perfect way to help “make teething happy”! Their formula is made with clove oil and is specially designed to be gentle on tiny gums. All of the ingredients are easy to recognize- Olea Europaea (Olive Oil), Eugenia Caryophyllus (Clove Bud) Flower Oil, Rebaudiana Leaf (Stevia), Mentha Viridis (Spearmint) Leaf Oil and Tocopherol (Vitamin E). All good stuff. You just rub one or two drops on baby’s gums with your clean finger and it should help almost instantly! 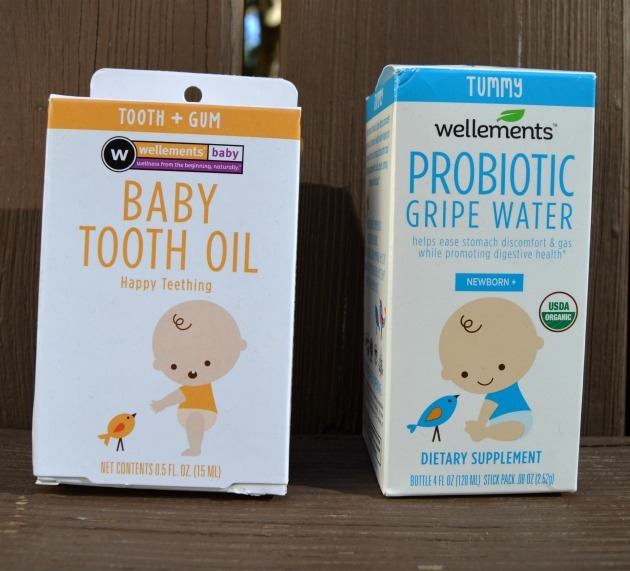 Wellements Baby Tooth Oil is not homeopathic and does not contain benzocaine, belladonna, alcohol, parabens, gluten, dairy, soy, artificial colors, artificial flavors, or unnecessary preservatives. If you feel that baby’s fussiness may be due to an upset stomach, you may want to try Wellements Organic Probiotic Gripe Water. You can learn more about Wellements Baby Tooth Oil at wellementsbaby.com. You can purchase it through Amazon or check Wellements store locator to find a convenient location for you. I hope you found this article useful in identifying symptoms teething babies may be displaying and in helping you learn about baby teething remedies. Has your baby started teething yet? Definitely want to try this. Both my babies were late teethers. I tried clove oil with my first baby and worked great for numbing, but I used it very sparingly.